Today is my 1 year Blogiversary and I’m quite excited. It’s a big deal to make it through the first year of blogging and I’m seriously excited about what the next 12 months will bring to Real Food Girl: Unmodified. To thank all of you for putting up with me for an entire 365 days, I asked you over on my Facebook page if you’d rather have this recipe OR my split pea soup with ham recipe. Hands down this recipe won. But for those of you who asked for the soup, don’t worry. It will be on the blog later this week. I also have some fun surprises for the rest of the week to celebrate the success that you have helped Real Food Girl experience so stay tuned. The Stud Muffin found this Cinnabon Copycat recipe online over at the Slow Roasted Italian and said that we *had* to make them. I took a look at the recipe, made a couple changes, nothing major, and The Stud Muffin and I fell in love with these. Even bigger bonus is that the grandkidlets love them, too. 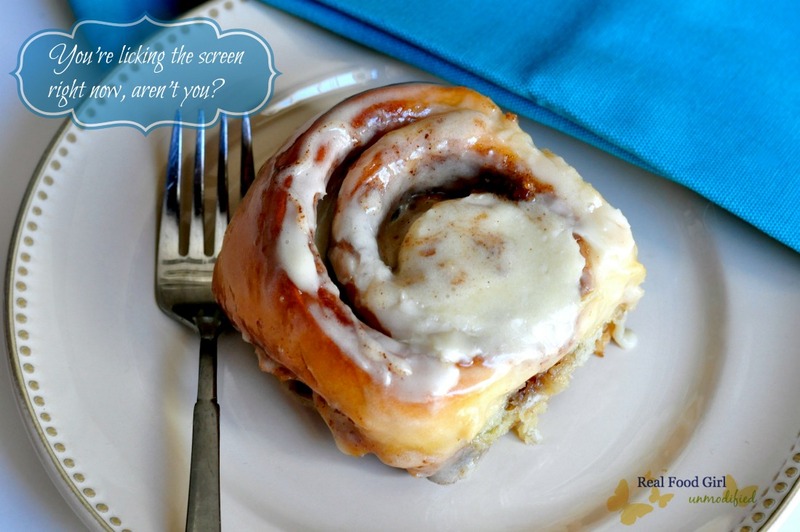 Before I get to the recipe, I feel obligated to tell you about what a Cinnabon Cinnamon Roll is made of, so that you don’t just decide to go indulge in one of these instead of taking a little extra time to make your own. Believe it or not, since switching to Real Food, I’ve missed Cinnabons a little. Go ahead and get all Judgey McJudgepants and “Eew” me all you want, but I liked the taste of them. I shouldn’t miss Cinnabons. They’re nothing but a chemical shizstorm that contain lovely ingredients like High Fructose Corn Syrup (HFCS) made from GMO corn. They also contain GMO soybean oil, have 8 grams of saturated fat, 5 grams of trans fats (plastic anyone? ), 67 mg of cholesterol, and not the healthy cholesterol that you get from say, pastured eggs. Nope, this form of cholesterol is from those lovely, rancid, hydrogenated and partially hydrogenated soybean oils they use. Is a surfactant, detergent, and emulsifier used in thousands of cosmetic products, as well as in industrial cleaners. 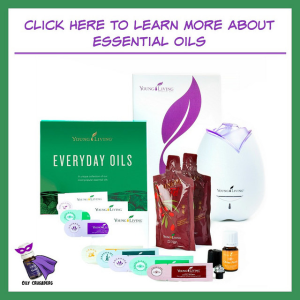 It is present in nearly all shampoos, scalp treatments, hair color and bleaching agents, toothpastes, body washes and cleansers, make-up foundations, liquid hand soaps, laundry detergents, and bath oils/bath salts. As if those ingredients weren’t bad enough, they even throw in some stearoyl lactylate and azodicarbonamide. Just click each word to know what they are. The more research I do, the more I’m glad I can make a healthier, more REAL version of a cinnamon roll. Lastly, you should know that their cream cheese frosting contains margarine, artificial lemon and vanilla and Sodium Benzoate- a preservative to keep foods from molding. Mmm- food that probably should be moldy, but isn’t because of a preservative. Yikes! I only share that information so that you can make better, educated decisions about what you eat. If you want to eat a Cinnabon once in a while, be my guest, but at least you’ll do it knowing exactly what they contain. 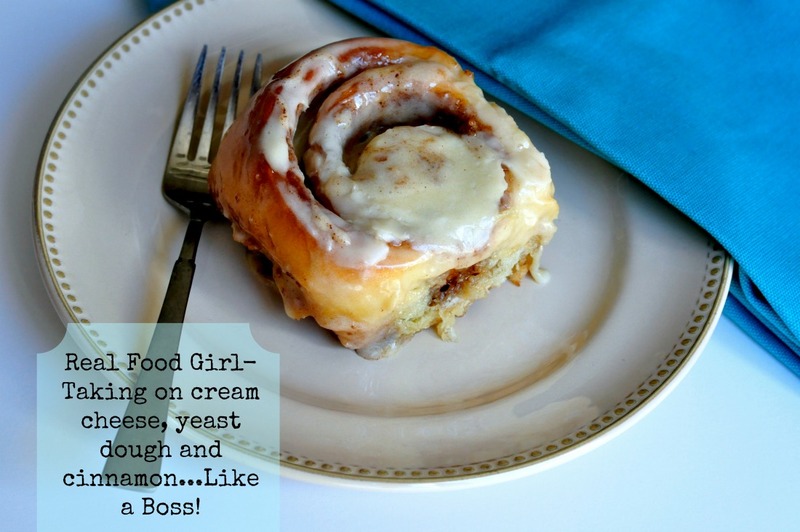 I’d personally rather make my own since these better than Cinnabon® cinnamon rolls do not contain HFCS, GMOs, soy, margarine, stearoyl lactylate and azodicarbonamide, modified corn starch, fake lemon, fake vanilla or sodium benzoate. 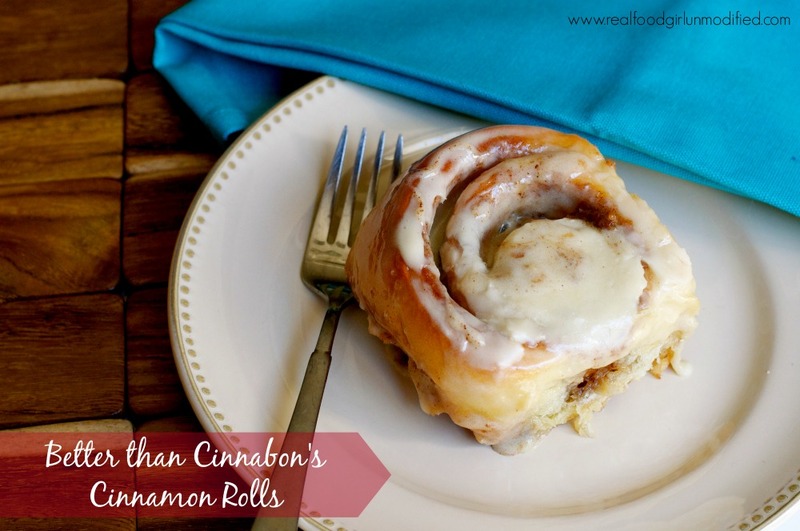 I’m using all non-GMO, organic ingredients so that when I want to enjoy a warm, gooey, cinnamony pillow of sweet, buttery dough on occasion, I don’t feel bad about eating a couple of these better than Cinnabon cinnamon rolls. Just don’t do it in one sitting. Trust me on this. These are made with much better ingredients, but they are still something that should only be enjoyed on occasion so you don’t slip into a sugar coma. You need to know that these Better than Cinnabon Cinnamon Rolls taste 10 times more mind blowing after they’ve had a chance to rest for 24 hours. The flavors seem to deepen and develop and everything tastes better after 24 hours, even the frosting. No- I’m not crazy. I know you won’t be able to wait a full 24 hours before giving into temptation, but at least try to save as many of them as possible so that you can experience these at the level of amazingness at which they should be enjoyed. Promise? Good. Let’s get to the recipe. 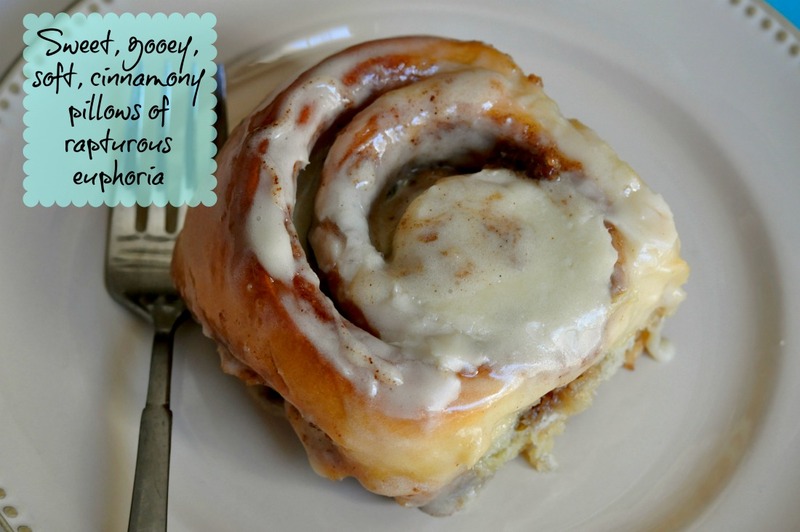 These cinnamon rolls are a sweet, gooey, soft, cinnamon-y pillow of rapturous euphoria that will make your knees buckle. In the bowl of a stand mixer fitted with a dough hook; add the water, sugar and yeast. Swirl to combine. Allow yeast to bloom, about 5-7 minutes. This is important. Make sure your water is between 110 and 120 degrees F.
In the meantime: Melt 6 TB of butter in a small saucepan over low heat. Combine buttermilk, eggs and butter. Beat with a fork until eggs are mixed. The butter may start to cool and chunk up, this is normal and OK.
Once the yeast mixture is bubbly and frothy, add the buttermilk mixture to bowl of stand mixer. Mix on low and add 4 cups of flour, one cup at a time. Add the salt. Once flour is mixed in, add remaining flour slowly until dough becomes a ball and completely pulls away from the walls of the mixer. Your perfect dough ball will clean the bowl. Mine takes 5 ½ cups total. Knead dough on medium-high for 5 minutes. Ol' Blue (my KA mixer) has a tough time staying locked during this step, so I have to hold it down and I typically only knead it for 2-3 minutes in the mixer and do the rest by hand, about 2 minutes by hand. Lightly dust a large cutting board with flour. Turn dough out onto the floured cutting bard and knead a few turns, shape dough into a ball. Coat the inside of a large bowl with the remaining 1 TB of room temperature butter. Place dough into bowl upside down, flip dough over and cover loosely with plastic wrap and drape bowl with a towel dampened with warm water and another towel draped over the damp towel to seal in heat. Set bowl in a warm place in your kitchen. Allow dough to rise for 60-90 minutes until nearly doubled in size. Meanwhile combine brown sugar, cinnamon and organic corn starch in a medium bowl. Stir with as fork until combined. Set aside. Turn dough out onto a lightly floured surface. Knead the dough a few turns, then using a rolling pin, roll the dough into a 18” tall x 24” wide rectangle. Spread softened butter around dough leaving the bottom 1” unbuttered. IMPORTANT that you do leave a 1-inch section of the dough unbuttered. Sprinkle buttered dough with brown sugar mixture, leaving the bottom 1” uncoated. Press sugar mixture into dough by gently rolling with your rolling pin. Starting at the top, tightly roll dough toward you, using the last 1” to seal roll. Cut dough roll in half and then cut those halves in half, giving you 4 pieces. Cut each of those pieces into 1/3rd. You will have 12 pieces. I use a bench knife/scraper to "Cut" the dough into sections. Grease (2) 7”x 11" baking dishes. Place rolls in pans evenly spaced out, 2 rows of 3 rolls in each. Make sure to put the end pieces upside down. Loosely cover with plastic wrap and drape a towel over pans. Set pans in a warm place and allow rolls to rise another 60-90 minutes until rolls have doubled in size and are touching. You can use 9x13" pans, but the rolls don't rise enough to where they touch, and they don't taste as good unless the rolls get smooshed together. This is why I use smaller 7"x11" pans. In the meantime prepare frosting; add cream cheese and butter in a large mixing bowl. Beat with an electric mixer until light and fluffy. Add sugar, lemon juice (and zest if using), vanilla and salt. Beat until mixture is light and fluffy, about 5 minutes. Set aside. Love your blog! I came across it looking for some recipes for my non-gmo blog. I’m definitely sharing this one!, I’m sure I will find some others, too! Hi Cristy, I’m happy you found my blog. Feel free to share my blog posts, I just ask that you use your own photos and any recipe of mine you feature on your page, please rewrite it in your own words and give links back to the post or recipe you are sharing with “Recipe adapted by Real Food Girl: Unmodified 🙂 Thank you! Thank you, Cristy! 🙂 Welcome!